APA KATA PAKAR KELAUTAN TENTANG RECLAIMATION YANG KETERLALUAN DI P.PINANG ! PETALING JAYA: Penang is opening itself up to the possibility of having more natural disasters like flooding and tsunamis, due to coastal reclamation works going on in full swing, reported New Straits Times today. The report quoted Dr Zulfigar Yasin, a Universiti Sains Malaysia marine biology professor, saying the reclamation works would also affect the island state’s fishery and tourism industry. “It is serious enough for the state authorities to know that they are jumping into the unknown. Worse still, Penang’s environment is like a volcano waiting to erupt,” he was quoted saying, adding that the issue was a ticking time bomb. Massive reclamation works are ongoing at Gurney Drive and the Queensbay area opposite Pulau Jerejak. Three man-made islands are expected to be created in the south of the island to facilitate the RM46 billion Penang Transport Master Plan. According to Zulfigar, things have changed drastically in Penang in the last 10 years. 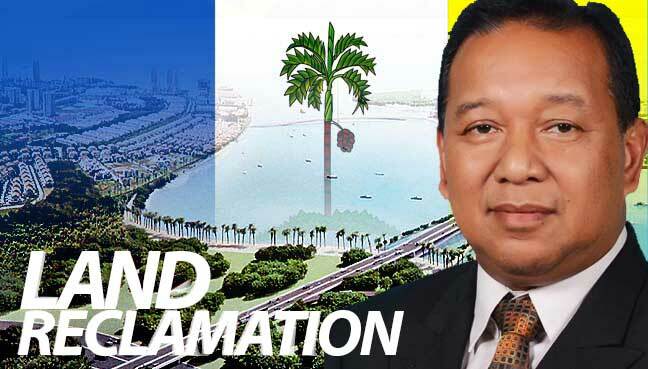 “We see rapid and huge reclamation projects for development, especially in the Free Trade Zone, Tanjung Tokong and the proposed southern area. “Penang’s shape used to be rather jagged, but now, it’s more rounded. This means that most of our coastlines, especially in shallow areas, have been reclaimed,” he said, adding that if such reclamation continues unabated, it would affect people’s livelihood. The reclamation would also affect the state’s seawater quality, and impact the fishery industry, where fishermen would lose their fishing grounds, he said. Penang would also lose out on water tourism and medical tourism if the reclamation continues, Zulfigar said. He urged the authorities to come up with a study on the state’s coastline and to look at the impact of reclamation to mitigate the problem. “We need a master plan and new guidelines to ensure sustainable development.